Where would you rather be... Keppel Bay Sailing Club invites you to enjoy fantastic views of Keppel Bay and the islands, while relaxing in modern, air-conditioned facilities and enjoy affordable dining excellence. There are three amazing venues situated in Yeppoon. The Clubhouse is located right beside the beach and the view is maximised with windows spanning the full length of the eastern side of the Clubhouse, while on the Deck, the north-eastern corner of the building offers a sea-side alfresco environment. Try the popular Beach Club Cafe, located downstairs at the Clubhouse. Try their casual sailing experiences while you're there! The Spinnaker building is located diagonally opposite the Clubhouse and offers modern dining and gaming facilities with an extensive gaming lounge, kids entertainment room and the magnificent Spinnaker deck overlooking the Keppel islands. 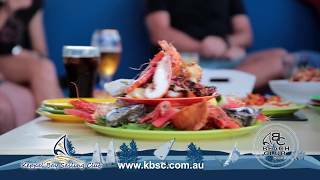 Krackers Bar and Grill is located on the western side of Yeppoon in Bowls Street. It offers modern club facilities with a relaxed atmosphere. Enjoy their private and spacious gaming room, pool table, bar and lunch and dinner menu. KBSC also caters for corporate functions and special occasions and are happy to provide assistance and attention to detail to ensure your special day creates happy memories.